The USS ANTRIM (FFG-20), an Oliver Hazard Perry class frigate, was commissioned on 26 SEP 1981. 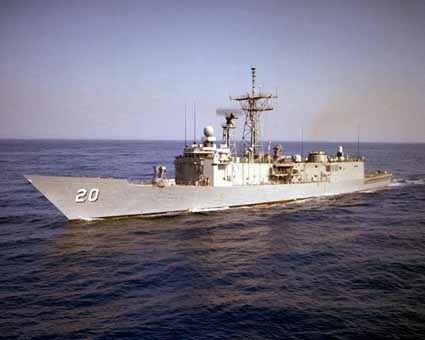 USS ANTRIM served her country for 14 years, 7 months and 12 days, until decommissioned on 8 MAY 1996. AUG 1997 - AUG 1997 Recommissiond as TCG GIRESUN (F 491). The second Antrim (FFG-20) was laid down on 21 June 1978 at Seattle, Wash., by the Seattle Division of Todd Shipyards Corp.; launched on 27 March 1979; sponsored by Mrs. Richard N. Antrim, the widow of the late Rear Admiral Antrim; and commissioned at Seattle on 26 September 1981, Comdr. William H. Wright, IV, in command. On 1 October, Antrim departed Seattle en route to Mayport, Fla., her home port. She made stops at Mazatlan and Manzanillo before arriving in the Canal Zone on the 25th. The guided-missile frigate transited the Panama Canal on Navy Day, 27 October 1981, and continued on to Mayport where she arrived on 2 November. Antrim conducted independent ship's exercises out of Mayport on an intermittent daily basis until 20 November when she set sail for Guantanamo Bay, Cuba. The warship carried out shakedown training in the West Indies until 12 December. After a port visit to Ft. Lauderdale, Fla., she tested and calibrated her sound equipment in the Bahamas before returning to Mayport on the 20th to commence holiday standdown. The holiday leave and upkeep period ended on 11 January 1982 with her return to sea to conduct combat systems qualifications and trials. With that event, the guided-missile frigate resumed a normal schedule of operations out of Mayport in the local operating area and in the West Indies as well. On 26 April, Antrim departed Mayport bound ultimately for Bath, Maine, and post-shakedown availability at the Bath Iron Works. Along the way, she stopped at Yorktown, Va., to unload ordnance and atPortsmouth, N.H., for a port visit. The warship arrived in Bath on 7 May and commenced a repair period that lasted 16 weeks. She embarked upon the voyage back to Mayport on 27 August, made a series of stops en route, and entered Mayport again on 11 September. Antrim stayed in port for almost a month, putting to sea again on 8 October to carry out post-repair refresher training in the vicinity of Guantanamo Bay. The guided-missile frigate completed that mission at the beginning of November, made a brief call at Key West, and then executed advanced ASW drills in the Bahamas. She reentered Mayport on 12 November and remained there through the end of the year. Antrim ended holiday standdown early in January 1983, returning to sea to begin training on the 4th. At the beginning of February, she sailed north to Norfolk whence she conducted weapons testing and training. On 10 February, while she was engaged in those evolutions, a target drone skipped off the surface and struck Antrim causing a fire in the wardroom and in her electronics spaces. The accident killed a civilian instructor embarked in the warship. Antrim returned to Mayport and passed the rest of February engaged in repairs. The warship completed her weapons training and testing during March and spent most of April preparing to deploy to the Mediterranean Sea and in the Middle East. On 29 April, the guided-missile frigate stood out of Mayport on her way to the Strait of Gibraltar. She entered the Mediterranean on 9 May and joined the 6th Fleet. Antrim carried out normal 6th Fleet training operations until the second week in June. On 11 June, the warship transited the legendary Straits of the Bosporus and the Dardanelles and entered the Black Sea. For eight days, she conducted operations in the Black Sea and, during that time, also paid a four-day visit to Constanta, Romania. Antrim renegotiated the famous Straits of antiquity again on 19 June and resumed her operational schedule as a unit of the 6th Fleet. On 1 August, the guided-missile frigate passed through the Suez Canal and shaped a course for the Persian Gulf. Following a brief stop at Djibouti on 3 August, she began duty as a radar picket ship on the 4th. Except for a port call at Karachi, Pakistan, from 27 September to 4 October, Antrim, served in the Persian Gulf for almost three months. She carried out turnover formalities with her relief at Djibouti on 30 October, transited the Suez Canal on 4 November, and laid in a course for Rota, Spain. After stopping at Rota briefly on the 10th, Antrim set out across the Atlantic. She arrived in Mayport on 21 November and stood down for the last weeks of the year. The relative inactivity of the final month of 1983 carried over into and through the first month of 1984. Antrim did not put to sea again until the first week in February. On the 3d, the warship got underway for the coast of Central America. After a call at Puerto de Cortez, Honduras, on the 6th and 7th, she transited the Panama Canal on the 10th. For almost seven weeks, Antrim conducted operations off the western shores of Central America from the base at Rodman in the Canal Zone. On 28 March, she travelled back through the canal and set her course for Mayport. The guided-missile frigate stood into her home port on 2 April. She passed the bulk of the month engaged in repairs, completing post-repair sea trials on the 26th and 27th. On 28 April, Antrim headed north for port visits at Newport, R.I., and Portsmouth, N.H., followed by plane guard duty for Dwight D. Eisenhower (CVN-69). The warship returned to Mayport on 11 May and resumed local operations 10 days later. At the end of June, she headed for Guantanamo Bay whence she carried out refresher training until the end of July. After visiting Charleston at the end of the first week in August, Antrim arrived back in Mayport on the 11th. On 20 August, the guided-missile frigate began a two-month restricted availability at Mayport. She wrapped up the repair period with sea trials on 22 and 23 October and a stop at Charleston on the 24th to load ordnance material. Back in Mayport on 26 October, Antrim executed training missions in the local operating area until early in December when she began preparations for overseas movement. Holiday routine interrupted those preparations late in December, but the pace quickened in January 1985 as her February departure date drew near. On 4 February, Antrim stood out of Mayport on her way across the Atlantic. She made a short call at Rota, Spain, for fuel on St. Valentine's Day 1985 before passing through the Strait of Gibraltar and into the Mediterranean Sea. The warship made an expeditious transit of the Mediterranean, stopping only at Palma de Mallorca and Augusta Bay, Sicily, before negotiating the Suez Canal on 27 February. Steamingthence through the Red Sea and around the Arabian Peninsula, Antrim passed through the Strait of Hormuz on 9 March and entered the Persian Gulf. While cruising on radar picket station in the Persian Gulf, Antrim received a distress call from the Liberian-flag motor vessel, Caribbean Breeze, that had suffered an Iranian missile attack to her bridge. The guided-missile frigate and her embarked helicopter detachment-HSL-36, Del. 1- rendered assistance to the stricken vessel. Antrim, then continued her surveillance patrols of the troubled waters of the Persian Gulf until the end of the third week in April. At that time, she departed the gulf for a little more than a week to make a port call at Karachi, Pakistan. Back on station in the Persian Gulf at the end of April, Antrim responded to another call for help on 2 May after the Iranians attacked another motor vessel, Nordic Trader, with missiles. Again, the warship and her helicopter detachment evacuated casualties. Her remaining two months of surveillance patrols in the Persian Gulf provided no further untoward incidents. She turned her responsibilities over to Klakring (FFG-42) and Reid (FFG-30) on 5 July and shaped a course via Djibouti and the Red Sea to the Suez Canal. Through the canal on the 14th, she made a single stop-at Valencia, Spain-on her voyage across the Mediterranean.